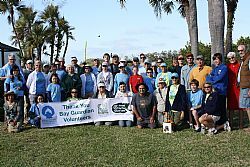 SARASOTA – A group of 47 adult and student volunteers with the SBEP Bay Guardian Program removed debris and exotic plants on Bowlees Creek Island on Saturday. Bowlees Creek Island is a bird sanctuary located near the mouth of Bowlees Creek. The volunteers removed an estimated 427 pounds of debris and exotic plants. A picnic lunch for the volunteers was donated by local residents to support the project. Participating groups included Around the Bend Nature Tours, Florida Audubon Society, Manatee County Natural Resources, Martha B. King Middle School in Bradenton, Take Stock in Children, Sarasota Military Academy, New College of Florida, and Sara Bay Marina. The Bay Guardian volunteers completed prior projects this year at Jiggs Landing in Manatee County and Baywalk Creek near New College of Florida. The next Bay Guardian outing is set for Perico Preserve May 4. Online registration is required for all Bay Guardian projects. The Bay Guardians are a family-friendly volunteer program managed by SBEP in partnership with Around the Bend Nature Tours. New volunteers receive a blue tee shirt featuring the Bay Guardians logo. Each outing features environmental education and a picnic lunch. Join the Bay Guardians for a single project or as an ongoing commitment. Local school, scout and church groups interested in volunteering should contact Stephanie Sherman at info@sarasotabay.org.